An amazing testimonial we just received today! This is why we do what we do! An amazing testimonial just came in tonight! 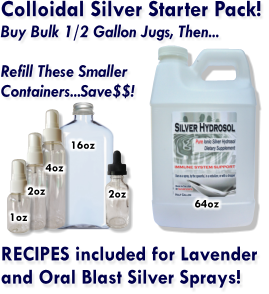 As we all know, colloidal silver doesn't get the attention it deserves in the scientific community, likely due to the lack of funding for something that is in direct conflict with Big Pharma. So we rely on our own experiences and the testimonials of others to get a feel for what works and what doesn't. "Recently I broke my left leg. I am a female 68 years old so this isn't good but God is good and he made the break where didn't move so after six and a half weeks. I'm already out of my brace and feeling free as a bird even though I'm not ready to walk yet. 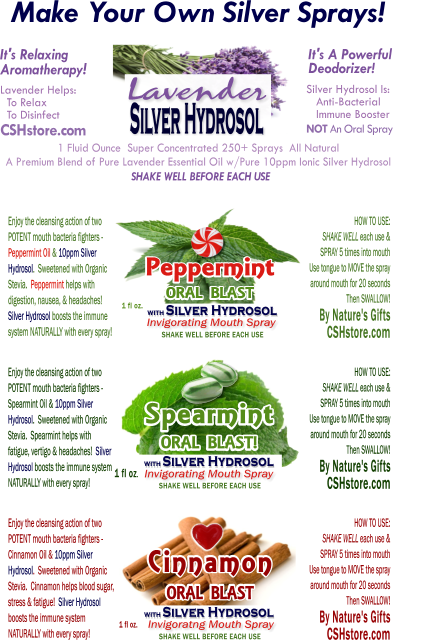 About the colloidal silver hydrosol that I get from this company. Because of my broken leg I have had to wear diapers 24/7 about 3 weeks ago I noticed my urine was getting a little cloudy and I felt a small lesion on the inside near my private area. This is very private but it's important that people know how powerful silver is. Anyway, this little sore was very painful. It would sting every time I went to the bathroom and I kept putting cornstarch on it and washing and keeping clean and dry. I did all I could think of for a week and a half; nothing I was doing was helping so I told my husband to go get the colloidal silver that we had bought from you and bring me two ounces to drink. I drank those two ounces that morning and then that evening I told him to bring another two ounces. The next day I woke up and my bladder felt fine. The lesion was healed in less than 24 hours. I have continued the two ounces of colloidal silver every morning and plan to do that as long as I am in this condition after that, I will go back to my normal schedule of having an ounce every 2 days but now I know how powerful it is at killing bacteria and healing wounds in such of private area. I'm very impressed and wanted the rest of you to know that this is a product that you should always always always have in your home for colds, viruses, flu, infections. Anything that could possibly be caused by a bacteria immediately start using these products. Another story that I have; the original reason I bought from this company is because they make a great gel. I had an MERS staph infection that I received from a gnat bite on my upper cheek. That night during my sleep I scratched it then it turned into an abscess. I thought it was just a pimple but it didn't act like a pimple it was aggressive it didn't ooze a lot, it just swelled and started eating up the tissue on my face. I went to Urgent Care and got a series of antibiotics which I took with no results I refilled it and took another series and that did not heal it. I tried using numerous natural products that I had including alcohol and iodine and black tar, herbal poltaces and nothing was stopping the spread of this staph on my face. It would come up in little spots. When I would start to get results, it would just travel somewhere else and it severely affected my skin. I ordered the gel silver hydrosol and applied it every night and within a couple of weeks I started seeing results. I had this staph infection for a year before I started trying the gel and within a few months it began to heal and I would put the gel all over my cheeks and between my eyes because I noticed some spots coming up around my eyebrows and I just kept attacking it and staying on top of it and eventually I got it off of my face. Now I'm sure it has gone somewhere else in my body where it might be hiding and waiting to come up again. That I don't know but I know what to do and by drinking the silver everyday, I think that eventually I will be rid of this nasty ugly bacteria! Thank you for making a great product and I hope that this information I have shared will help others to make a good decision to use this anytime they have a problem they think may be infected by bacteria. God bless. Sandy"